The Eiffel Tower and the Sacre-Coeur Basilica are iconic images of Paris and are certainly magnificent in all of their grandeur but some of my favorite photos record the seemingly inconsequential events of daily life - a solitary man drinking a glass of red wine at a cafe, a group of small children playing soccer, or a young woman cooling her toes in the fountain in the Jardin du Palais Royale. I'm not sure if it's his fashionable red-rimmed glasses or his total concentration as he artistically forms each gold letter, but there's something about the sign painter that seems to symbolize the people of Paris, for whatever it is that they're doing, Parisiennes usually seem to enjoy doing it...with perhaps the exception of driving and waiting in line! The "before" photo was taken while having tea with Christine, a charming Canadian woman whom I met while snapping pictures during our tour of Legeron Flower and Feather Boutique and the "after" photo was taken a couple of weeks later when I returned to the Galerie Vivienne with my parents-in-law. What are the subjects of some of your favorite photos? Please feel free to include an internet link in the comment section if they're posted on the web. 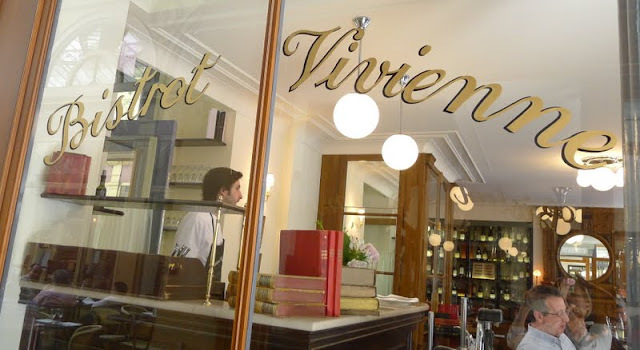 I wish much success to Bistrot Vivienne--the sign just makes my day. I love handpainted, and especially gold, signs and lettering. A lost art maybe, as is hand engraving on silver--now it's all done by machine. 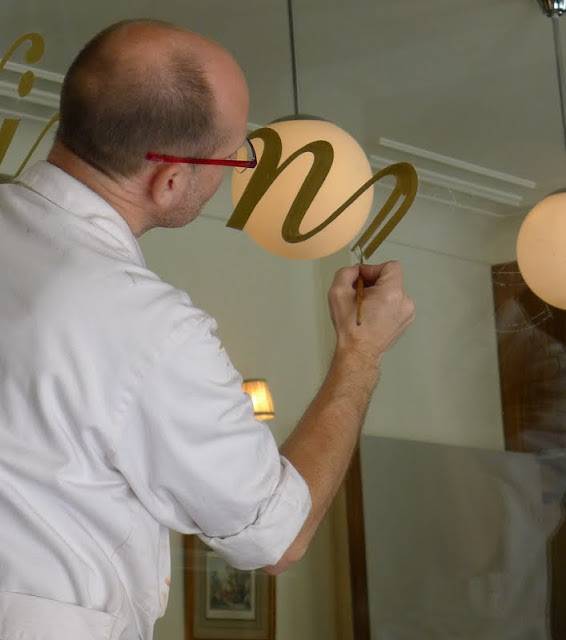 Gold lettering really is an art, at least that's what I was thinking while watching the painter. Another lost art is the gold lettering on the spines of books. A bookbinder recently told me that there are only a few people who can still do that in Paris. Having spent hours in elementary school tracing letters and learning how to link letters together to form a continuous line through the words, I can appreciate the beautiful work done on this window. 45 years ago in my school, we first learned writing by using a pointed tool, which we held in our right hand (whether we were right or left handed) like a pen to punch needle size holes over the shapes of curved letters already printed on the page. Line after line we would go down the page, under close supervision of the teacher until our fingers and wrist were tired. I don't use the same letter shapes today but I could switch back to it easily, so deep are these shapes embedded in my memory. My daughter used to use the pointed tool in pre-kindergarten in Switzerland to punch out shapes and animals. It was called "pickage". We moved before she progressed to using the tool to punch out letters. The teacher explained to me that this was to develop the small muscles in children's hands before introducing them to pencils. SInce I rarely write anything by hand anymore, I really felt my muscles when I wrote a note yesterday. I have an embarrassing admission to make - unbeknownst to me when I responded to anonymous above is that the comment was made by my Swiss husband, Stephane. I kept thinking that I hadn't ever heard of anyone else but the Swiss using the pointed tool to form letters but I never stopped to think that the comment was written by my own Swiss in residence. And even more embarrassing is that his English is so darn good while I misspelled the one French word that I used! "Pickage" is supposed to be "piquage" from the verb, "piguer", to sting or to stick. Stephane has promised to sign any future comments so that I know that it's him! HA! I had not seen these latter exchanges--exactly what you were writing about the other day. Serendipity.